Or rather, since the dogs we were working with only spoke Finnish, Menan! Yes, we’ve been mushing again. This time I managed to avoid getting ill as soon as I got home, which means I don’t have the time for a repeat of the Gone Mushing blog which chronicled our trip two years ago. There are plenty of photos to browse through though, and such an adventure needs a few words at least. I’m in love with the Arctic winter, its harsh beauty, its quiet, its challenge. And I doubt there can be a better way to experience the wildness of the North than by gliding across the snow hauled by a team of enthusiastic dogs. After that first trip in 2008 I knew I had to return. This trip was very different, but every bit as magical. We couldn’t get in at the place we went to before, so ended up going to Finn-Jann. Unlike Harriniva, Finn-Jann is a tiny, family run kennels catering for only one or two groups at a time. It’s a very friendly place offering fantastic hospitality, and a great sauna and outside hot tub. We spent two nights out at wilderness cabins, but the rest of the time was based at Finn-Jann. One of the consequences of this (rather than the five nights out trip we did before) was that I felt I didn’t get to see such a change in the landscape as we covered ground. There were advantages too, though. Our guide, Jussi, was able to adjust the dog teams as we became more confident. One day when we were only out for the afternoon an extra dog was added to each team—youngsters yet to learn the secret of going all day, but giving their all for a few hours. We really moved that day! We took teams of six dogs out on our final day too, but with the extra dog being a more experienced dog with the stamina for an all day run. Well true to form, Wednesday did not go according to plan. We’d spent the night out at a lakeside wilderness cabin, and the day’s sledding began by heading out across the frozen lake. It wasn’t long before we hit a patch where there was a lot of water on top of the ice, between the ice and the snow. Quite reasonably really, huskies are not that keen on getting their feet wet. There was a bit of hesitation, a bit of progress, and then as my two lead dogs decided to turn round and run back into the team, complete chaos; a tangled mess of lines and a lot of very cold water. For a while I managed to keep my feet on top of snow, but inevitably as I and the young woman on work experience helping Jussi out thrashed around trying to bring some order to the chaos we both discovered that calf height water proof boots are no defence against knee deep freezing water. I had discovered something I have in common with huskies—I’m not keen on getting my feet wet either. Even when we’d sorted the lines out and managed to get moving again, the going was really tough. 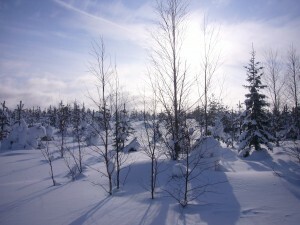 The snow was very soft and several times crossing the lake Jussi’s snowmobile got stuck. The first few kilometres of that Wednesday took two hours; we were way behind schedule. It was a relief to get off the lake and change my soaking socks. Even more so to get to a kota for lunch and dry my boot liners by the fire. In case you’re wondering what this has to do with heavy snow, the snow is the reason there was water on the lake. The weight of a fresh fall of snow pushes the ice down into the water below and the water comes up any way it can—often through holes made by fishermen. All in all, although it was milder and the landscape perhaps not as wild, this year’s trip was certainly not short of challenge. I feel I built more of a relationship with my dogs and that we really did work together as a team and look after each other. Gliding through an Arctic forest on a sled is an experience that is hard to describe—you really should give it a try. 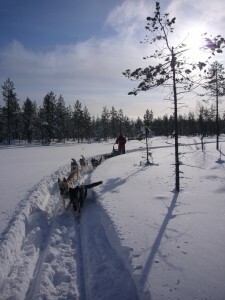 This entry was posted in General and tagged dog sledding, finland, finn-jann, husky, mushing on March 21, 2010 by Chris.